A cross between broccoli and Chinese kale. 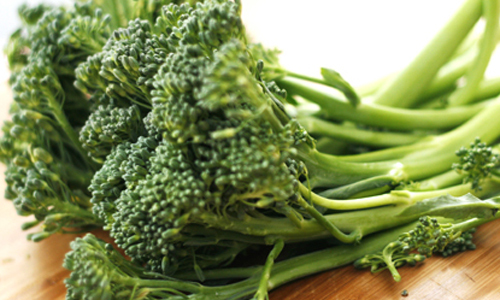 Its tender stalks are thinner than broccoli and have a slightly sweeter taste with a peppery bite. Developed by Japan’s Sakata Seed Company in the 1980s for its increased resistance to heat, Australian supermarket suppliers began growing broccolini in Australia in 1999. It’s high in iron, calcium and potassium and contains vitamins A and C. Available all year. Look for bright green florets and firm stems. Keep in a sealed plastic bag in the fridge and use within a week.